To fully understand part of what makes Ava DuVernay’s Selma so great, we need to acknowledge how an individual piece of art can simultaneously serve entirely separate (non-allegorical) purposes and effects, and the individual selection of one does not harm the other. This movie can be taken only as a historical drama regarding the push for racial equality in voting registration and events around the marches led from Selma to Montgomery, Alabama in 1965, but it also can be viewed, with equal efficiency, as a look at the triumphs, struggles, and schisms of any social rights movement, and the perseverance of humanity, even in the face of oppression and disadvantage. Even in this, however, DuVernay makes sure that the film never forgets or strays from delivering a gripping, moving, and impactful recreation of a powerful and important chapter of American history. Her skill is even more laudable when one considers that this is the first major studio film she has ever made, and yet has a consistent and confident style that makes the final product all the more remarkable. At the center, but not the sole subject of Selma, is Martin Luther King, Jr., who is played in a phenomenal performance by British actor David Oyelowo – a performance with such convincing realism that it’s almost an embodiment at times. The film starts in 1964, where King practices his acceptance speech for the Nobel Peace Prize while Coretta Scott King (Carmen Ejogo) fixes his ascot. The delivery of the speech itself is intercut with the 16th Street Baptist Church bombing, in which four girls were killed and many others were injured on September 15, 1963 when a black church in Birmingham, Alabama was bombed by white supremacists one Sunday morning. Intercutting is one of Selma’s strongest points, where many climactic moments are edited with anything from another event, real life footage, or the reactions of others not present. This is part of what is arguably the movie’s best sequence – a brutal recreation of the so-called Bloody Sunday march, where Alabama state troopers and a handful of local white citizens intercepted and assaulted civil rights marchers at the Edmund Pettus Bridge in the city of Selma. What follows ranges from shots of the protestors being assailed by billy clubs, whips, and tear gas, to a reporter in a telephone booth giving an account of the developments unfolding, to the shocked reactions of many Americans watching the scene unfold on live TV, all the way up to President Lyndon B. Johnson (Tom Wilkinson). It’s an unflinching piece of film, well-acted, crisply shot by cinematographer Bradford Young, excellently directed by DuVernay, and masterfully cut together by editor Spencer Averick. The screenplay by Paul Webb is unable to use any speeches by King in verbatim, as apparently public speeches are protected by copyright, and another studio currently holds the rights to them, loaned out by MLK’s estate before Selma went into production. However, if I wasn’t informed of this before sitting down and watching the film, I never would have guessed that the text of the addresses given within are anything but genuine – a testament to the skilled writing on display. The movie’s big cast is full of solid performances, but with its size, and especially when you consider the extent of what Oyelowo brings to the table, the results can vary. Take Tom Wilkinson and Tim Roth, as LBJ and Alabama governor George Wallace, respectively. Both actors have had long, varied, and successful careers, but despite being dressed and made up to the best they possibly could, there’s never a moment of connection where they fully disappear into their characters, and often there’s a lack of a physical resemblance to the well-known politicians they portray. But things like this don’t distract from the rest of the magnificent performers of ranging fame, from Oprah Winfrey as Annie Lee Cooper, who participates in an early scene that sets the tone for the rest of the movie, to largely unknown industry veteran Henry G. Sanders, who plays the elderly father of an unarmed black man killed by a policeman after a failed night march. A small but memorable scene with Sanders and Oyelowo is simply captivating. My mention of “an unarmed black man killed by a policeman” in the last paragraph brings home the timeliness that this movie is released in. Following news story after news story that has definitively stated to skeptics that the United States is still not yet a post-race society, or at least the level of generalizations and blatant racism that often takes place in debates over such issues and cases may achieve a similar result. When Selma comes to the end of its 127 minutes, it’s on a note of optimism, but not one that suggests that the battle fought in the 1960s was (or is) finished. 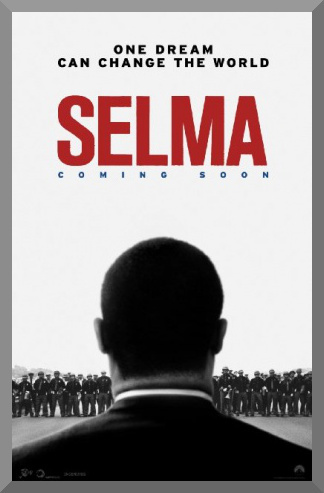 The film is triumphant in conveying its messages, and by showing the uncertainty faced by both King and the other lead figures of the civil rights movement, it avoids depicting anyone as unrealistically stoic or falling into levels of hagiography. Poignant without being overt or pushy, Selma is an example of art serving two purposes in another way: an absorbing travel back a half-century in time to a crucial part of recent history, but also something that feels irrevocably timeless, urgent, and very much of now.